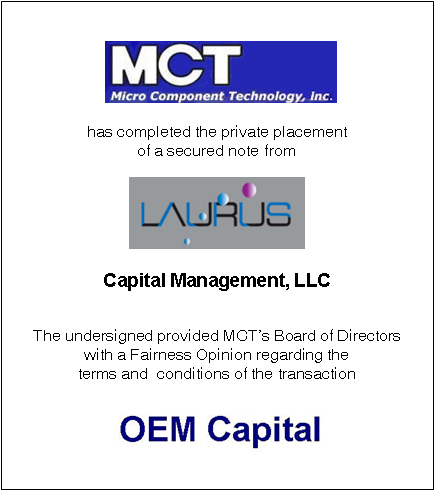 OEM Capital provided Micro Component Technology, Inc.’s Board of Directors with a Fairness Opinion regarding the terms and conditions of their private placement of a secured note from Laurus Capital Management, LLC. As a result of our involvement, the Board of Directors of Micro Component Technology were provided with an independent, objective, professional opinion on the fairness of the terms and conditions of the financing agreement between the Company and Laurus Capital Management, LLC. Laurus Capital Management, LLC is a privately-owned investment company. Micro Component Technology, Inc. designs, manufactures, markets, and services automated test handling equipment for the semiconductor industry. The Company sells its products primarily to semiconductor manufacturers and third party test and assembly companies.